Celebrity Endorsers: Are You for Real? When I was growing up all my friends wanted to be models (shocking right? ), some even managed to experience a taste. But none of them really went anywhere (not so shocking). I wondered why – they were gorgeous and their beauty could convince anyone to buy anything. Through the years though, I noticed that the anonymous faces on the cover of “Seventeen Magazine,” were being replaced by actresses, musicians and now athletes. This was occurring in all the ads inside the magazine as well. What was happening? What happened was this: advertisers uncovered the power of persuasion found in endorsements. Persuasion is less reliant on language therefore a snapshot of a famous face will do just fine. To endorse something means to support or approve something publicly. This entity is almost always a person, and in many cases today, a celebrity. The use of a celebrity distracts the audience, making a weak argument stronger. How does this work? Well, instead of lengthy paragraphs, a pic of your favorite celeb propels a consumer to rely on peripheral processing. But peripheral cues have their weaknesses too; they often have short lived effects. This explains why celebs endorse the same product repeatedly – the messages are relayed at high frequency so we lest not forget. But just how often does a celebrity really approve and trust the product he or she is endorsing? Would it not be deceptive if they didn’t approve at all, and perhaps were just doing it for the publicity, a favor or money? It’s obvious if you watch Tiger Woods in action, he is always dressed to the nines in Nike attire. 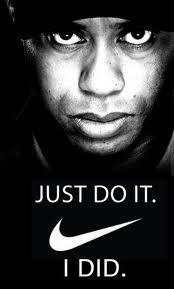 Even though Tiger is endorsing the product in commercials and print ads, it’s clear to fans and consumers he approves to some degree if he wears Nike every time he plays golf. Now, Justin Bieber endorses the Pro-Active acne skin care product. Rihanna endorses Cover Girl. While their faces are on the front page of these advertisements, do these celebs go home and use this product, or something else? How do we know? Yeah sure, on the infomercials Biebs is lathering his face with Pro-Active – but this doesn’t mean that he does this off screen. This goes the same for Rihanna and all the other celebs that have their faces plastered in ads around the globe. All consumers see is their favorite celeb with what appears to be their product of choice. Consumers put a significant amount of trust into these people; they assume that there must be something about this product that is worth a celeb’s time and effort. And – if this is not the case and they are lying, resulting in deceptive advertising. While we can’t always prove if celebrities use their endorsed products at home, it’s important to note that what is unacceptable in Canadian advertising is perhaps not the same as in the United States. The Federal Trade Commission regulates advertising in the U.S. and has different standards in comparison to Canada. Can you guess which are higher? Attention: How Do They Hold It? Don’t They Mean The Same Thing?